Kevin Hillstrom: MineThatData: Hashtag Analytics: Free Spreadsheets And A Booklet! Hashtag Analytics: Free Spreadsheets And A Booklet! You knew it was coming! You wanted a concise methodology for forecasting the future of your social media community. And now you have it. 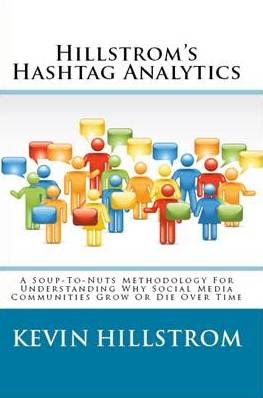 Hillstrom's Hashtag Analytics is a soup-to-nuts methodology for forecasting the future of a social media community on Twitter. A FREE dataset (in .csv format) that contains eight weeks of participant behavior in the #blogchat community, summarized at a participant/week level. A FREE spreadsheet that allows you to forecast the future trajectory of your social media community (you will have to write the programming code to get your data into the spreadsheet). 44 pages of text that outline the thought process behind forecasting the future trajectory of a social media community on Twitter. You are unlikely to find anything of this nature from social media analytics experts, and if you do find something that allows you to forecast the future of a social media community on Twitter, you're going to pay an agency a hundred thousand dollars for the right to do the forecasting! This booklet is available in three formats. Available in print from Amazon.com for $7.95. Available via Amazon Kindle for $2.99. Available via Barnes & Noble Nook for $2.99. If, after you buy the book, you find that you want an expert to run a forecast for your social media community on Twitter, give me a holler, I'll be happy to perform the analysis for you!